The Maryland State Roads Commission, predecessor of the Maryland Department of Transportation State Highway Administration (MDOT SHA), retained the Baltimore-based Hughes Photography to photograph the construction of Maryland’s infrastructure from the 1920s to the 1940s. These images document the construction methods and equipment from that time. The photos also present detailed visual information about the bridges and thei surrounding communities. Many images provide rare glimpses of the 19th and early 20th century bridges that were demolished to make way for the structures built during the 1920s, 1930s and 1940s. A hallmark of the 20th century was advancement in material technology. These images show steel and concrete bridge designs that replaced designs with traditional building materials such as stone and timber and the relatively more recent stalwart iron. New materials expanded Maryland’s nascent highway system, moving freight and people from railways to roadways. These photographs capture not only the process of building larger and stronger bridges but also the evolution of transportation from serving local business to facilitating broader economic growth. These archival photographs are presented to the public as a collection that documents bridge construction throughout Maryland between the 1920s and 1940s. You can download any of the images. Originally photographed with a medium format camera and scanned at high resolution, the archival photos depict the bridges and surrounding areas in crystal clear detail. For more than 30 years, the images were stored in a closet at the MDOT SHA headquarters in Baltimore. Since 2013, the collection has been indexed, catalogued, and geo-located. Captions add information about the bridge type, location, and construction methodology, as well as local history. The Hughes Photography Company was started in the late nineteenth century by James F. Hughes of Baltimore. He died circa 1903 and the company passed on to his employee, James Scott. Scott likely took many of the photos from the 1920s and 1930s. His son, Gaither, took over the business and shot photos during the 1950s and 1960s. All of the photos are 8” x 10” black and white and record the progress of many of the SRC’s bridge construction projects. Collections of Hughes Company photos can be found at the Maryland Historical Society, the Enoch Pratt Free Library Maryland Department and the Maryland Room at the University of Maryland College Park Library. As time passes, bridges age and weather, displaying changes wrought by time. These images are a link to the past. They depict construction and ultimately capture the moment when the structure was complete, new and untarnished, a realization of the engineer's designs and the worker's skills. 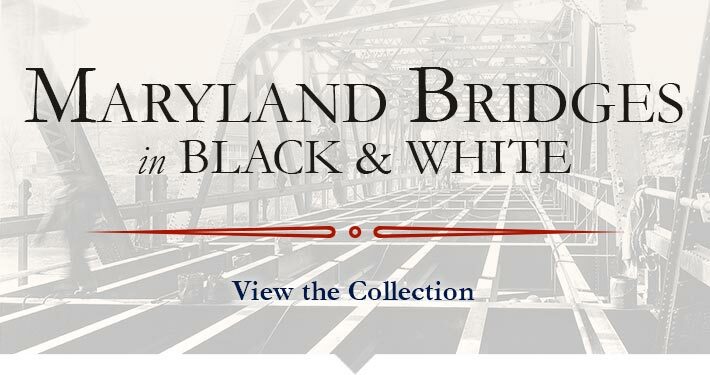 By documenting the use of barges, steam shovels, rivets, and dredges, these images capture Maryland’s rich engineering heritage and add to our knowledge of bridge building. The photos have evocative period information such as how men dressed for work and the sight of a steam shovel in motion. We hope that you will enjoy your tour of Maryland’s engineering heritage.